- Pay min.3 Nights+Get Free 1 Night (Total= 4 nights) not accumulative in one stay such as for 8 nights stay get also free one night (Total= 9 nights) . - Refund 1 night stay (Promo pay 3 night stay get 1 night free=9) will be Refund into guest account by Paypal within 48 hour after check-in. Discount of 100 USD by min.14 Days Advance Booking. Get One Welcoming Balinese Buffet Dinner include Cook Service and Get Complimentary Live Bali Dance Performance in the villa by Pay Only 175 US$ (Up to 7 persons) Grab The Chance to Learn and Experience more about Balinese Cultural just A Step of Your Room. A renovated beautiful villa situated on quiet, secured and private Seminyak residential area on North Kuta area, Seminyak. Our villas are the perfect getaway from the hustle and bustle of the city life and yet it is only around 10 minutes away from where the action is. 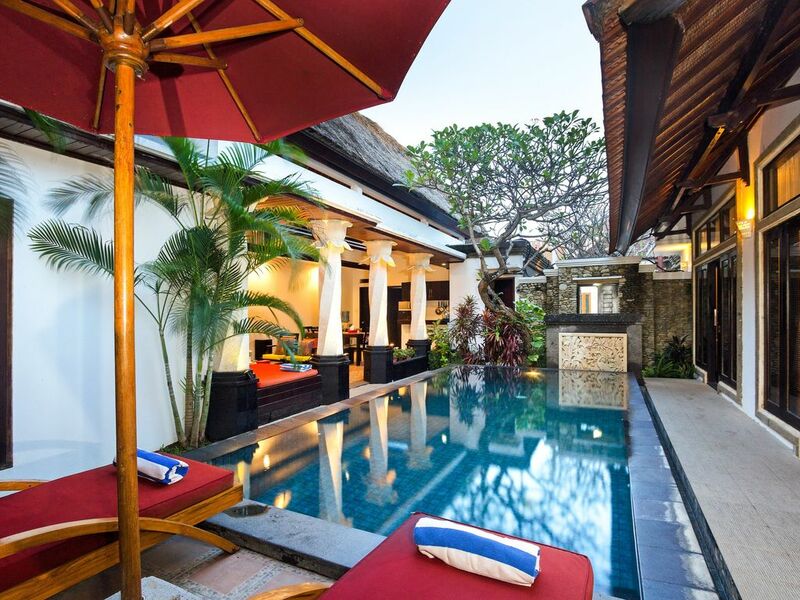 This 3-bedroom-villa with private pool provides the perfect balance between a romantic ambience, serene surroundings and exclusive privacy, and it is just a few minutes drive to some of Seminyak's best white sand beaches, famous restaurants, boutiques and nightlife on the Bali island. The villa's free private car rental facility include English fluent driver is ready whenever you need a ride to any Bali destination. Now you can do customize private tour along the holiday with only pay car patrol on your own expense. This romantic getaway villa on top of 250m2 ground is equipped with 3 bedrooms (2 en-suite, 1 medium bedroom), 2 en-suite bathroom-showers, 1 bathroom with shower and its own pool. There are full air conditioners, safe deposit box, housekeeping service and enjoy fresh daily breakfast to start your day. It is luxuriously furnished with top quality fittings, a 24/7 security service and the villa has an open half-living area is equipped with Wifi, LCD TV, iPod dock and Hifi stereo system next to the dining room with full equipped kitchenette on the side. The airport transfers (in-out) are free of charge and a one hour massage service per person is also included. Laundry, a chef and a baby sitter service are available by surcharge. Not like other villas, villas water plumb are unsalted water with clean and fresh water. If you combine the feel of luxury Bali Villas with our well known service, you will understand why many guests make their bookings months (and sometimes over a year) in advance. An unforgettable stay awaits you! 1) Do the villa rental include free car rental with driver service for entire stay? Yes, the villa rental include complimentary package car rental with driver service for entire stay (worth of 35 USD/day). 2) Do guest get free airport pick up and drop off at any time, although late hour? Yes, the complimentary of airport pick up and drop off is available at any time. 3) Can guest use the complimentary car rent with driver service to drive to Ubud or other Bali area? Yes, guests can ask our driver to bring guests to Ubud or other long distance Bali area by buying car gasoline on guests convenience budget. 4) Do the villa rental include free breakfast? Yes, the villa rental include free hot meal breakfast which will be prepare direct from villa kitchen by our cook. 5) How many extra beds do the villa have? The villa have 4 extra beds for 10 persons stay. 6) Can guest ask the villa to arrange any day trip or tour or buying some ticket? Yes, guest can ask the villa staff to arrange any day tour or buy some ticket. 7) Is there any cook for lunch or dinner preparation? Yes, the villa can provide the cook service by surcharge of 35 usd per day exclude meal grocerry. The meal grocerry will be prepare by guests convenience budget. 8) Can guest ask the villa staff to do food delivery? Yes, guest can ask the villa staff to do food delivery. 9) Can guest ask the villa to prepare any special occasion atmosphere such as birthday surprise cake or any Bali dance perfomance in the villa? Yes, you can ask the villa to arrange any special occasion for your stay on guests budget. 10) Do we get complimentary Bali body massage in the villa? Yes, guest will receive complimentary Bali body massage for one hour for one person. 11) Can the villa provide any pool fence and a baby cot, baby car seat and baby high chair for the stay? Yes, the villa can arrange free baby cot, baby car seat and baby high chair for one baby and arrange the pool fence by surcharge of 35 US$ per day. 12) How much is the cost for full tank of car gasoline on the villa car? The cost for full tank car gasoline is around 15 US$ and it can be use for 3 days ride. 13) How much is the overtime cost of the driver service after 07:00 pm? Guest can deal direct with the driver but some people give the driver approximately 35.000 IDR per hour or 150.000 IDR for entire night, please ask direct with the driver. 14) How much tipping the villa staff? The tipping is actually on guests convenience budget but people usually give by minimum 150.000 IDR (around 12 USD) per staff for entire stay for appreciation on staffs hard work, 3 or 4 staffs on the site. 15) Can the villa arrange additional car for bigger group of 10 persons stay? The villa can arrange additional car by surcharge of 35 US$/day include driver service exclude car gasoline, or upgrade bigger van by surcharge of 75 US$/day for 12 seated mini bus. 16) Can we have the villa car ready early in the morning for surfing schedule? Yes, the villa car operational hour can be arrange on guests need, also for early morning depart to any surfing place. 17) Can guest have any special request for breakfast menu as halal or vegetarian menu? Yes, please share all your special request upon booking. 18) Does this villa has secure entry gate or doctor visit by request? Yes, villa has secure entry gate and doctor visit by request on guest bill. It was a beautiful villa that is kept very clean and proper. The housekeepers were helpful and lovely people. Our guide Mr. Gusti was superb and always there to guide us thru the travel. His driving was also safe throughout. Well recommended for people to choose. Overall, my family had "a very good" stay at the villa. There were two senior citizens in the group. Overall, my family had "a very good" stay at the villa. There were two senior citizens in the group. There were several changes and Ade was responsive during our booking and run-up to arrival. Bedrooms were kept clean. Staff friendly. Breakfast was good. TV channels enough to keep the oldies occupied. The location was a bit of a way to walk (ie not suitable for oldies) but Mr Gusti, the driver, was helpful. Thank you to everyone who took care of our family. the team at the villa went the extra mile and made our stay a well worth one.. having the free car service is very useful and allowed us to explore all the great restaurants around the island... Will definitely return for sure.. Overall was an awesome stay at this villa. We had total peace and quiet with the villa staff appearing only when we needed them - a 100% privacy for us. The villa staff Dimin, Agung and Gusti (Driver) were very attentive to our needs and were accommodating to all our requests. What we read and saw on the villa website was what we got...we never felt short changed. Overall great stay in villa and Bali. Only downside was the absence of English Premier League football channels...but than again, I might be the only EPL fan. Had a wonderful time in this villa. No problems whatsoever with the friendly staff and we even had a wonderful guide and driver Mr. Gusti. Both caretakers in the villa were always smiling and ever helpful. Gusti was also always smiling and took us for some wonderful sightseeing and amazing local food. The villa was clean and the breakfast offered was good. I will definitely suggest this place to others going to Bali. Jalan Gunung Atena no: 20, Bali Grya Residence, Padang Sambian, Seminyak, Bali.